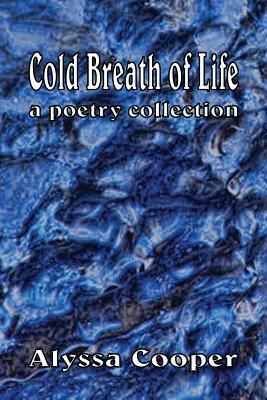 Preface - Cold Breath of Life In this, her first full collection, Alyssa Cooper proved to me that she is a natural poet, a borne poet. It seems as if these poems flowed to her, through her eyes, her ears, her heart and then flooded out through ink onto the page. I can only imagine the surrender, the joy, and the softness that surrounded her as these poems arrived in the voices of the night-flowing through her as she listened in those moments of silence, epiphany, wonder and tears. This first collection of poetry by Alyssa Cooper is remarkably "brilliant." As I approached this manuscript as editor, I became immediately immersed in its depth-not only in a breadth of image and language in the printed lines themselves, but in those innermost spaces between-between the lines, between the words and then between the pages. As I read, in anticipation, turning each page, the next title drawing me in and then each poem after again-washing through. Cascading down, but not like a pouring rain floods the branches and leaves on a tree, but instead gentle like a morning dew falling lightly upon it-each droplet noticed, felt, absorbed, cherished. You, the reader, will find in this book poetry that reaches out and touches, and then embraces. These segments of time in time, time in place, time in life-and as the title suggests, the breath flowing within and between. You will sense as well the "cold" in that breath is indeed not a statement of its apathy, but instead its subtle and passive generosity. These poems of acknowledgement, of acceptance, and of recognition and of release place themselves here in a flowing sequence. These not like an ocean that lay before us, distant and on its surface-shallow. But instead, much like a wandering stream flowing apprehensively down slow turning bends-inviting us to follow, to explore, to reflect, and to inhale the depth of the beauty of its flow and in all that surrounds. This journey lays itself out throughout this entire collection of poetry and, in particular, her placement of and revisits through the "Crown" trilogy -tearfully heartrending. Rumi once said "Sell your cleverness, and buy bewilderment." In this collection of poems, Alyssa Cooper has done that-and given it back. Bruce Kauffman, Editor.